Visitors often misjudge the vast distances they'll have to travel ​in Southern Africa. For example: South Africa is 32 times larger than the Netherlands, yet many people still think it is possible to travel across the country in merely three weeks... To a large extent this misconception is due to misinformation from other tour operators, using Google Maps to calculate and plan their tours. On this page we try to illustrate why travel times outlined by many other tour operators do not hold true. ​Let's look at a trip from Johannesburg airport to Mkhuze Game Reserve. ​Why is this not correct? 10:00 - Land in Johannesburg and hit rush hour at customs because most flights arrive in the morning. 13:45 - Stop en route to refuel, stretch your legs or even lunch after the first 200km on a dual carriage highway (provided that there were no road works or accidents along the way). 17:15 - Only 100km to go but you still need to shop for groceries! 18:15 - Pack your groceries in your car and hit the road again. It's getting pretty dark, the road is a lot busier this time of day... but the road is good, so you manage to smash the next 50km in 30 minutes! Do you want to spend your holiday like this? ​After a day like that, do you want to take part in another activity or even cook dinner? and let us handle the stress and logistics. 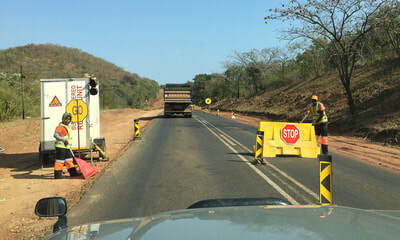 At road works, one lane is usually closed, working in 20 minute intervals they rotate the direction from which cars are allowed to drive in the remaining lane. It is not uncommon to encounter up to three such ‘Stop & Go’ points within 600km, thus you could easily add an hour to your travel time. 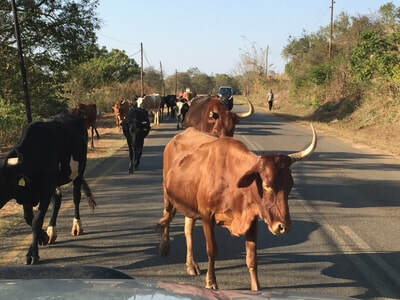 Cattle may be encountered on roads, including highways and toll roads. 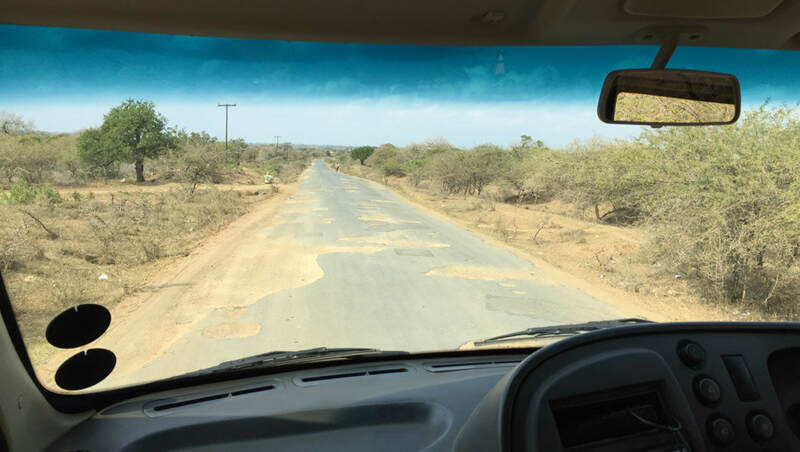 When turning off the highway, towards reserves, you will often be driving on poorly maintained roads, which could decrease your average speed to as low as 20 km/h at times. 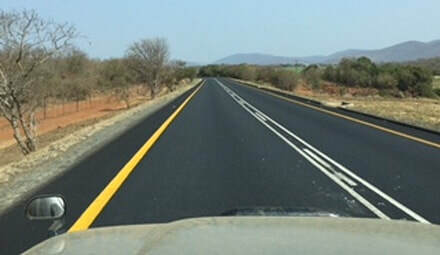 A beautiful road indeed, but there is no emergency lane and overtaking is prohibited for nearly 100km. If you should get stuck behind a truck or tractor en route to the airport, you could easily miss your flight. This photo depicts 5 rows of cars on a 4 lane highway. How could this be? During traffic jams or accidents it only takes a few minutes for impatient drivers to decide to use the emergency lane to get ahead and keep moving. This too becomes congested and could block traffic for hours. On toll roads you may indeed drive 110 – 120 km/h. 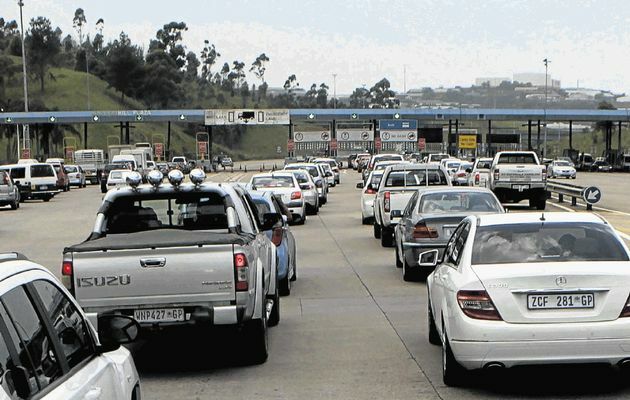 However, it is time consuming to pay toll fees, especially when the power is out and they must manually calculate how much change to give each and every customer. You could be delayed by 30 minutes to an hour on such occasions. Driving through a game reserve takes time. The average speed limit is 40km/h and keep in mind you’ll be stopping for lunch breaks and viewing animals along the way. 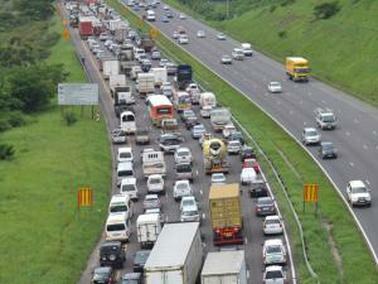 All of these delays could result in an average speed of only 20km/h. So, while it seems easy to cover 200km between two camps in Kruger in just one day, it may actually take you up to 10 hours to cover that distance. At Tailor Made Safaris our travel time is usually well estimated and we endeavour to not spend too much time in the car, thus ensuring that you have more time available to enjoy and experience your destinations. However, a long drive between destinations is, at times, inevitable. The extensive self-drive pack we’ve complied for you clearly sets out distance and travel times expected for each day’s journey. Thus, providing you with peace of mind, so that you may enjoy your vacation without the worry of whether-or-not you will arrive in time. Tailor Made Safaris at your service!